There are several different Toro snow blower models available which are capable of dealing with the majority of situations you are likely to come across. 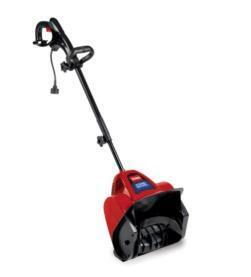 Toro electric snow blowers shown below are the ideal choice for clearing decks, steps, sidewalks, and driveways. They are lightweight and extremely easy to use, and can clear snow upto 6 inches deep throwing it upto 30 feet away. First up is the Toro Power Shovel which can clear 300 lbs of snow per minute. Being electric, there is no oil or gas to mix which means it is virtually maintenance free, just simply plug it in and you're ready to go. Weighing just 13.5 pounds it is a lot easier to maneuver than a gas unit. The curved rotor and inverted funnel housing efficiently remove snow while reducing clogging. 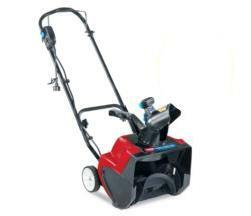 This is a compact, Toro snow blower that clears a 15" wide path and throws snow up to 25 feet away. It weighs just 25 lbs and with Qwik-Key™ starting it eliminates the need for gas and oil. It incorporates an intuitive ergonomic handle and zip deflector control which make it easy to maneuver. 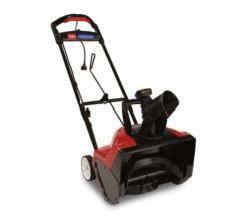 This Toro snow blower performs just like a gas unit but without the maintenance. The imaginative Power Curve technology moves far more snow quicker and largely eliminates clogging, cleaning all the way down to the pavement. It incorporates an ergonomic handle design that allows for a good level of comfort and ease of use. The Zip Deflector™ control enables you to throw snow high, low or in-between, and the positive-locking ratchet deflector can be adjusted in under a second with just a touch of your hand. It has a Cord Lock System to prevent cord disconnects, and you can use the lift handle to easily transport the unit from place to place. Large 6-inch wheels increase maneuverability.